Get the most out of your day at Machu Picchu and read our insiders tips on everything you need to know! Please feel free to leave any comments or tips of your own for other visitors to read! 1) November – April is considered the wet season at Machu Picchu (and the highlands of Peru), so be prepared with rain coat and umbrella. For rest of the year Machu Picchu is sunny and dry, but the weather can sometimes be un-predictable, so be prepared with a poncho or a light rain coat. 2) Before you visit Machu Picchu, go to La Casa Concha Museum in Cusco (Santa Catalina Ancha). It will give you a great overview of Machu Picchu, the history, Hiram Bingham, artefacts found etc., but best of all there is a large scale model of Machu Picchu to help you get your bearings. 3) Biting insects at Machu Picchu are famous, and are probably one of the most discussed topics on the Peru forms on Trip Advisor. Make sure that you go prepared with plenty of insect repellent and wear long clothing and closed toes shoes! 4) The first shuttle bus from Aguas Calientes to Machu Picchu departs at 5.30am. Return busses from Machu Picchu to Aguas Calientes stop running after sun-down about 6 – 6.30pm. 5) There is an onsite doctor and pharmacy at Machu Picchu, and both are located just outside the entrance gates to Machu Picchu. 6) There are many steep steps at Machu Picchu, take your time to walk around the site, don’t rush and rest when you need to. There are no benches or seating inside the park, but sitting down on grassy terrace areas is allowed! Take something to sit on, as those biting bugs might bit your bum! 7) There are no wash rooms within the Sanctuary of Machu Picchu, with the only toilets onsite being located below the snack bar area, close to the main entrance. Don’t be caught short at the other side of the Machu Picchu citadel, it could take you 20 minutes to get to the toilets. Entrance is 50 Peruvian cents. So to spend a penny, make sure you have some change handy (sorry couldn’t help the pun). 8) At the entrance to Machu Picchu there is a large layout map of the site. If you are planning on doing any of the hikes at Machu Picchu, this is a good time to see just where they start. Finding them once in the citadel can be difficult, especially the Inca Bridge and the Sun Gate treks. 9) If you are looking for that extra special touch to mark your visit to Machu Picchu, make sure you get your passport stamped with the Machu Picchu official stamp. Go to the stamp office, just past the inside of the entrance to Machu Picchu (next to the luggage storage). Don’t be shy as sometimes the workers are not forthcoming in offering the stamp. There is no charge. 10) You can hire a local guide at the entrance to Machu Picchu. They are all qualified licensed Machu Picchu guides, but the level of English can vary greatly so take some time to speak with them to make sure they offer a good level of language skills. Don’t bother trying to haggle the price; the price is 120 Soles for a tour of approximately 2h30m. 11) Walking sticks are acceptable within Machu Picchu, but only 1 stick per person and it must have a rubber tip. 12) The 7-8 am entrance time to the Huayna Picchu Mountain trek can often be misty. You may find that you get to the top of the mountain and the view of Machu Picchu is obstructed. The cloud / mist clears around 9am, so perhaps the 10-11 am entrance time is better! 13) Make sure you are prepared with a sun hat (a large one), sun block and a pair of sun glasses. In these high altitudes of the Andes, the sun is strong and will burn you quickly. See if your hotel has a small umbrella that you can take with you to protect from the sun, and perhaps the rain! 14) Large rucksacks (more than 20 litres) are prohibited from Machu Picchu. But you need not worry; there is a secure luggage storage area just past the entrance to Machu Picchu (on the inside). The charge is a very reasonable 3 Soles (US$ 1.20) per day. 15) Avoid disappointment and book your Machu Picchu tickets in advance. Waiting until you travel could be a disaster as often the tickets sell out well before you date of travel. 16) There is a small snack bar at Machu Picchu which is located just outside the main entrance. Burgers, pizza, sandwiches, empanada, cakes and much more are all on the menu. Prices are typically high, but the food is actually not bad. 17) If you are afraid of heights the Inka Bridge and Hauyna Picchu hikes are probably not for you. Steep pathways with sheer drops can be found on both treks! 18) Try to avoid buying your shuttle bus tickets on the day that you want to go to Machu Picchu. The ticket office (at the bus stop in Aguas Calientes) can often have long queues, which get mixed up with the people waiting in line to get on the buses. Buy them the night before (ticket office is open until 7pm). Shuttle bus tickets are valid for 3 days from the date of purchase. 19) Speak to your hotel in Aguas Calientes to see if they offer a box lunch that you can take to Machu Picchu. If not go to La Boulangerie de Paris in Aguas Calientes and get one of their high quality box lunches. Make sure you buy a giant cookie whilst you are there, they are incredible! 20) Machu Picchu tickets are only valid for 1 day, therefore, if you want to enter for 2 consecutive days or more, you will need to buy 2 tickets. 21) Entrance tickets to Machu Picchu Mountain and Huayna Picchu are purchased in combination with general admission to Machu Picchu itself. Tickets are limited to 400 per day so book 2 – 3 months in advance to ensure that you secure your ticket. 22) You can hike from Aguas Calientes up the mountain to Machu Picchu. There is a pathway that runs up the mountainside which partly follows one side of the road that the shuttle buses use. The hike takes about 1 hour to ascend and a little less time to come back down. Perhaps you might want to take the bus up and hike down! 23) If you are a keen photographer, and want to take pictures without people in the view, then you need to get there at 6am when the gates first open. Alternatively after 4pm on the afternoon there are only a few tourists still at the site. 24) Facing the entrance to Machu Picchu is the Tinkuy Restaurant (part of the exclusive Sanctuary Lodge Hotel). Buffet lunch is served from 11.30 am – 3 pm and costs US$ 40 per person. Entrance can be bought on the day, and is often cheaper than buying it through your travel agent! Soft drinks, tea and coffee are included within the price. 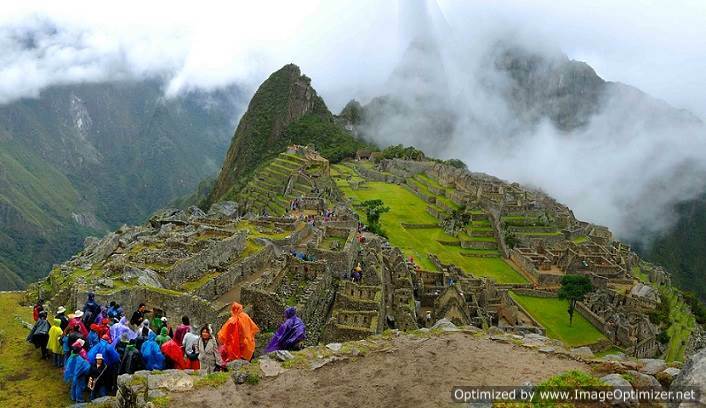 25) Allow 2 days and 1 night to visit Machu Picchu. Hotels in the nearby village of Aguas Calientes vary in price from as little as $20 per night through to US$ 1500 at some of the higher- end hotels. Whatever your budget for hotels, try and dig a little deeper for this 1 night as hotels are expensive for what you get.